Ship Virtual Prototype and Parametric Motion Simulator. An open-source application capable to run real-time ship motion simulations in a web browser, in any device of any operational system with HTML5 compatibility. Graphical representation of closed-form functions for heave, roll and pitch accelerations. 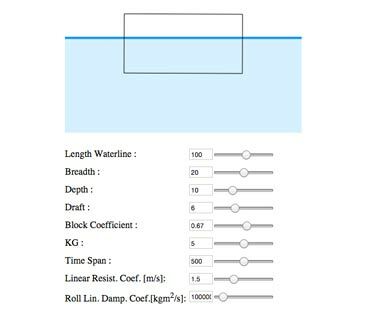 This application is capable of generating a vessel main lines from its main dimensions. It is possible to adjust the hull characteristics by changing secondary parameters. Graphical representation of estimated motion responses for ships. Heave, pitch, vertical motion and vertical acceleration responses are calculated as function of length, breadth,draught, block coefficient, waterline breadth and operational profile. They can be changed by clicking and dragging the sliders. 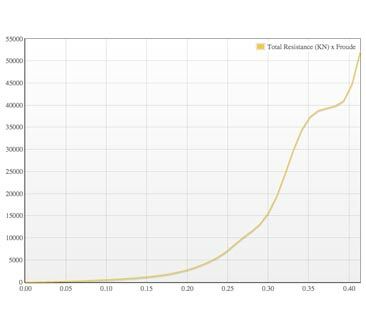 App to calculate the total resistance of a displacement ship based on the Holtrop and Mennen method. This work focuses on data-driven documents (D3) examples applied to the conceptual ship design process, especially in how to effectively and quickly filter and present complex input, multilevel and multiclient interactions, associating into design knowledge. The objective of this work is to present a simplified modularization process appllied to Ship Design. In short, given a module library, we are able to combine all the modules within and generate a fair amount of different, but viable designs. In the EEA methodology future scenarios are represented by the discretization of the contextual factors into epoch variables , within a range that takes into account the uncertainties and expectations. SFI is a widely used classification system for ships, oil platforms and other maritime structures. The SFI system allows its users to divide hierarchically the elements inside a maritime structure for a wide range of purposes related to control of shipping, offshore or shipbuilding operations. The objective of the parametric design procedure is to establish a consistent parametric description of the vessel in the early stages of design, starting from the basic design principle that a certain description of a vessel should be able to perform efficiently a given mission. This tutorial aims to introduce a very simple way of doing a parametric vessel modelling at Siemens NX. Divide the ship in systems containing modules so that these modules are distinguished from each other by its functionality. The objective of this report is to create one method that can be used to generate parametrized structural elements from a hull design. A web based parametric ship design tool, with an online graphical user interface, where the user can easily change the simple vessel’s parameters. It is possible to create a 2D drawing from a 3D model using the NX Drafting application.